Chuck (v.) to throw, hurl or pitch away. 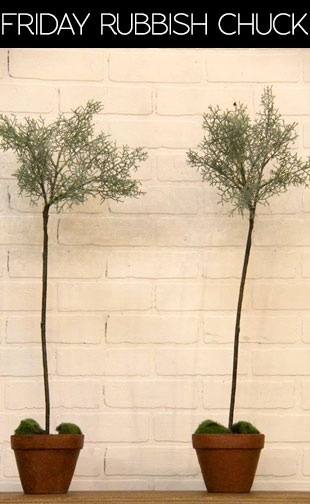 These two artificial trees are neat, but they’re no natural wonder. They are, however, a steal at less than half the original price. They’re cypress, by the way. Each stands 30” tall in its own personal clay pot. Easy maintenance: No watering. No trimming. No strange bugs eating up all the leaves. Plop them in your foyer. Fill a nook in your bedroom. Add flair to the family room. Just take them off our hands! Three sets available. Act now or lose out. All sales are final. No Holds. Come in or call 281-290-9565.